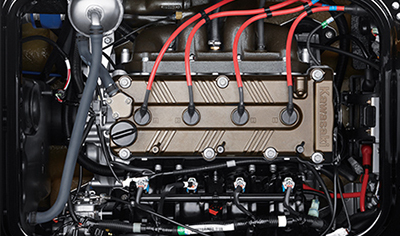 The stand-up hull offers the best of both worlds: agile handling and superb stability. This combination ensures the high performance required for racing while offering recreational riders a package they can handle with confidence. Development of the hull incorporated racing feedback. 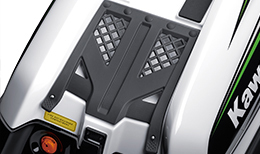 Its agile handling, complemented by great stability and increased power, allows high cornering speed. 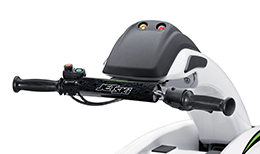 Corner grip of the well balanced machine exceeds that of the predecessor model – 800 SX-R. Sitting high in the water when stopped, the hull’s facilitates boarding. 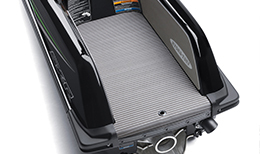 Water intake is via a special low-resistance stainless steel intake grate. 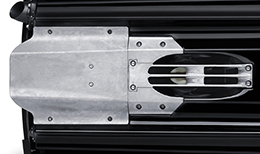 Its design, although slightly longer, was based on the highly efficient grate of the preceeding model – 800 SX-R. 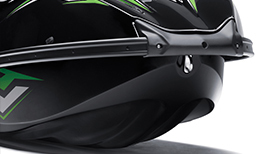 The Ultra 310R’s Kawasaki Splash Deflector (KSD): The ridges across the bottom of the bow deflect water splashing foward from under the hull. 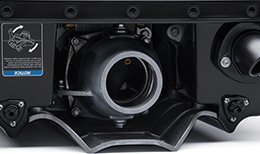 A fourth splash deflector mounted at the top reduces spray duirng high speed turns. 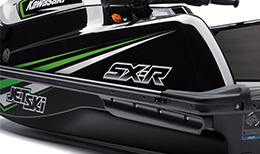 The JET SKI SX-R offers double the power of Kawasaki’s last stand-up model – a top speed 25% quicker than the JET SKI 800 SX-R. The SX-R delivers the impressive performance that racers crave: acceleration is overwhelmingly strong, and slalom course times are quick. 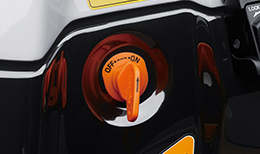 The broad range of 4-stroke power offered by the SX-R is very manageable, facilitating control.